BelarusDigest > All > Automobile Rebellion in Belarus? Yesterday, several hundred car drivers participated in a mass protest action called “Stop Gasoline” against the rising fuel prices in the Belarusian cities of Minsk, Homel, Brest and Mogilev. 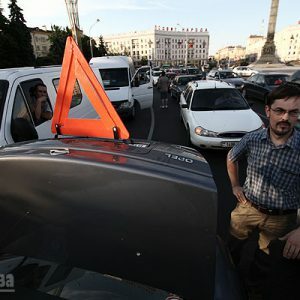 Following the call of the automobilist organization “Za-Avto”, drivers blocked the central avenues in the country, pretending that their cars have broken down. For hours, traffic jams and the blowing of horns made circulation on Independence Avenue in Minsk impossible. Gasoline prices were to rise about 30% on June 8th and they had risen by 25% just two weeks ago. In the aftermath of the protests, four activists have been arrested and sentenced to pay fines. The organizers of the rally have started collecting money to pay the fines. It is a revealing characteristic of contemporary Belarusian society that the rise of fuel prices finally brought many apolitical people to the streets. This was a protest organized by an automobilist association and not by a political party or movement. Over the last years, a very popular thesis among Western observers and diplomats in Belarus has been that the only thing that will make people take part in mass demonstrations will be an extreme deterioration of their living conditions. As long as Lukashenka can keep the relatively high living standards, low food and ultility services prices, they were convinced, Belarusians would not care to take part in demonstrations. What has happened in Belarus in the last two months is exactly the scenario that those observers predicted as a very serious threat to the Lukashenka regime. However, during the last weeks it became clear that the galloping inflation and rising prices would probably not lead to the predicted mass protests. Instead of complaining publicly and going to the streets, Belarusians usually chose a typical, matter-of-fact way of dealing with the situation. They bought what was left of cheap products, organized a black market website for currency exchange and they had no other topic for conversation apart from the rising prices. Whenever two people met, they discuss prices for bananas, buckwheat and cheese. Non-state media published leading articles dealing with the prices for food and electronic devises several days in a row while the state media largely ignore the crises. However, there was no feeling of discontent which reached the public sphere. Most people do not attribute the economic crisis to the mistakes of Belarusian authorities, but tend to repeat what they hear in the official propaganda: the resulting crises was the fault of those Belarusians who were buying cars abroad and also from the world financial crisis. Yesterday’s car rebellion was the first notable protest event since the brutal crackdown of the post-election demonstration in December 2010. While non-state media already hope that they will lead to a broad protest against the regime, this may not happen. Cars have become one of the most important status symbols in Belarus during the last months. Belarusians were buying cars in the West before the custom fees on them will rise at the beginning of July. There are more cars, including very modern ones, on the streets of Minsk than ever before. Depriving the Belarusians of driving their new cars because they cannot afford fuel anymore hits their self-image. They have stopped buying imported products because they are just too expensive but many are unwilling to stop driving their cars. Lukashenka has already demanded that fuel prices should decrease beginning Thursday morning. It appears that the Belarusian leader is quick to understand that he is on the verge of fighting a battle on too many fronts. He is fighting against the West, against Russia, against the opposition, against international media outlets, against the internet and now against discontented social groups. The question is whether Belarusians will make a connection between the devastating economic situation and political situation. If this happens, the power of protesters will be too overwhelming to handle for the regime. Russia, through the Eurasian Economic Community, has agreed to grant Belarus a USD 3bn loan, of which Belarus will only see USD 800m this month. The Belarusian government will only get the remaining amount, in two portions over the following two years, if it goes ahead with the privatisation of state companies. Analysts say that this loan is far from sufficient to really save Belarus from its current economic crisis. What Belarus requires is at least USD 8bn. It can get it from either the IMF or Russia, but only under the condition of privatising certain state companies. According to Belarusian economist Yaraslau Ramanchuk, Belarus can get about USD 50bn to USD 80bn from selling key 12 state companies. Belarus Digest has prepared a short overview of the main state assets in question. Beltransgaz is the Soviet era gas transit enterprise, formerly part of the USSR-wide gas pipelines network. It is currently jointly controlled by the Belarusian government and Russia’s state gas giant Gazprom. Gas transit has been a highly politicised issue causing frequent conflicts between the Belarusian government and the Kremlin in the past. Eventually, in 2007 Belarus agreed to sell a 50% stake in the company for USD 2.5bn. The sale came in four stages and was finalised in February 2010. In June 2011, Russia’s prime minister Vladimir Putin and Gazprom CEO Alexei Miller both said that negotiations over the acquisition of the remaining 50% stake in Beltransgaz were in its final stages. On one hand, control over the country’s gas transit system is more valuable to Gazprom than a simple 50% stake in it. On the other hand, the current financial crisis could make the Belarusian government more willing to compromise on the price. Apart from that, over the past years Russia made a serious progress in diversifying its European gas export routes by constructing the Nord Stream and South Stream pipelines. Nord Stream’s first line is expected to start operating in late 2015. It decreases the importance of gas transit though Belarus. Depending on these factors, the price may or may not be significantly larger than the USD 2.5bn Gazprom paid for its current 50% stake in Beltransgaz. Belaruskali is the world's second largest producer of potash. It is one of the main cash-generating assets of the Belarusian government. Before the crisis, the company generated sales of around USD 3.4bn. The obvious candidate for acquisition of Belaruskali is Russia's Uralkali, a private potash company. Uralkali and Belaruskali export their products to third countries through a joint venture, the Belarusian Potash Company. Belarus Potash Company accounts for 30% of potash supplies worldwide. This week Belaruskali has sold its stake in the International Potash Company, its different JV with Uralkali. The government of Belarus is understood to be in passive talks with Chinese investors over a sale of Belaruskali. However, as the government of Belarus gets more dependent on financial support from Kremlin, Uralkali’s chances of getting Belaruskali are rising. Uralkali’s largest shareholder Suleyman Kerimov is known to have good ties with the Russian government. The government of Belarus may reportedly raise up to USD 7bn from the sale of a blocking stake the company. Mazyr Refinery and Naftan are the main oil refining companies of Belarus. Lukoil and Rosneft reportedly expressed interest in their acquisition. Lukoil has previously been in talks over it, however it has abandoned the plans after unsuccessful talks with the Belarusian government. A specific problem with Naftan was that the government of Belarus only wanted to sell it together with the unprofitable Polymir. 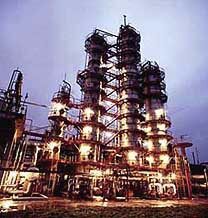 Oil refining has traditionally been one of the main cash sources of the Belarusian government. However, the recent conflict with Russia around export duties for oil and oil refining products has damaged the profitability of the refineries. The latest news was Belarus holding negotiations with Venezuelan state oil companies on them buying stakes in Naftan and Mazyr Oil Refinery as part of the Belarusian-Venezuelan cooperation. Naftan has been valued at USD 3bn in the reports. TNK-BP, the Russian oil company controlled by BP and a consortium of private Russian investors, already owns 42.5% in Mozyr Oil Refinery and seems a likely candidate for a further stake in it. If, as rumoured, Russia’s state oil arm Rosneft becomes shareholder in TNK-BP, the chances to get control over Mozyr using Kremlin’s pressure will seriously increase. The possible valuation of Mozyr is USD 2bn. MTS is the largest mobile phone operator in Belarus in terms of subscriber numbers. It operates under the brand of the Russian telecom operator MTS which is controlled by the investment group AFK Sistema. However, the Belarusian government still owns a 51% stake in MTS Belarus. Belarus has been reported to put its stake in the company for an international tender. MTS has stated it is not interested in bidding, however it organically remains the party most interested in acquiring the asset. The government of Belarus may get around USD 1bn for its stake in MTS. Belarus has seemingly agreed to merge MAZ, the Minsk Automobile Plant, with Russia's Kamaz. The deal is to be closed before end of 2011. The figure of USD 2.5bn was mentioned as the valuation of MAZ, however it is unclear whether this stands for the whole company or for the controlling stake only. In any case, the Russian investors seem to be unwilling to pay a price so high and will seek to renegotiate it. It is obvious that Russian investors will have the upper hand in privatising Belarus’ state assets. No other investors, especially from the West, are likely to be willing to take the political risks associated with Belarus. Unlike them, most Russian investors will be able to count on support from the Russian government. Russian banks already hold a dominate position in Belarus as the majority of main Belarusian banks are Russian-owned. Apparently, the Belarusian economy will come out of this crisis even more Russian-controlled.